Ebonny shares her views on lessening dark spots and uneven skin tone, drawing from past experience and experiences of those she cares for. Do you use a high SPF (30 or above) broad spectrum sunscreen every single day? Do you conscientiously limit sun exposure as much as possible every day? Do you consistently use a treatment to fade existing dark skin? If the answer to any one of the above is "no," then you have work to do in order to optimise your chances of attaining clearer skin. If in the future you can answer yes to all the above questions, then you are very likely to see visible and ongoing improvement in your skin and achieve a significantly more even-toned complexion. Have you managed to fade dark spots/skin patches only to have then recur? Hyperpigmentation/dark spots/dark skin patches on the skin can emanate from a number of causes including acne, injury, infection, insect bites, razor rash, surgical and/or cosmetic procedures. Moreover, hormones and heredity are major factors. Whatever the source, sadly some people with the skin condition do become emotionally ground down with despair at the thought of having to constantly face the world with skin which seems miles away from being even toned, clear and instantly accepted as presentable. Although there is no miracle cure which will make your hyperpigmentation permanently vanish overnight, there is a lot you can do to help control and improve the appearance of your skin thereby uplifting your self esteem and confidence. Although hyperpigmentation is not necessarily a painful skin condition, the ongoing discolouration can lead to frustration, withdrawal, depression, isolation, embarrassment, despair, stress, dejection and much general unhappiness. It often feels easiest to simply hide away indoors but with much patience and positivity there can be a way forward. Concerning uneven skin tone, the negative attitudes of others can leave a person feeling bad about themself. Just know that no matter your skin condition, if you are a beautiful person on the inside, you ARE beautiful full stop - and henceforth spend less and less time around anyone who does not have the wisdom to treat you right. And if it's any consolation, you are not alone in having this skin issue. 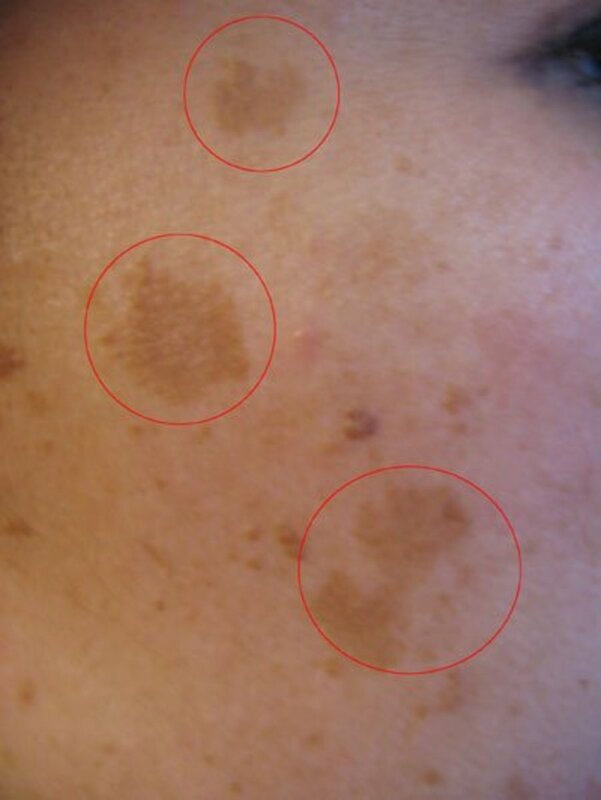 As you can see from these Hyperpigmentation Images this skin condition can occur on different parts of the body, affects both males and females, people of different ages and skin colours and varies in extent and severity. When the body produces too much of the brown pigment melanin, the result is darkened areas of skin called hyperpigmentation (HP for short). It is a condition which can affect all races but seen more in darker skinned people/black people. For those who are predisposed to this skin condition, sunlight triggers overproduction of melanin. Melasma, age spots, freckles, dark spots, liver spots and sun spots are examples of HP prompted by sunlight triggering excess melanin to be produced by the body. Whether the dark skin is caused by hormonal changes, e.g. Melasma, or by hereditary factors (e.g. freckles), again, sunlight is a very significant and detrimental activator. 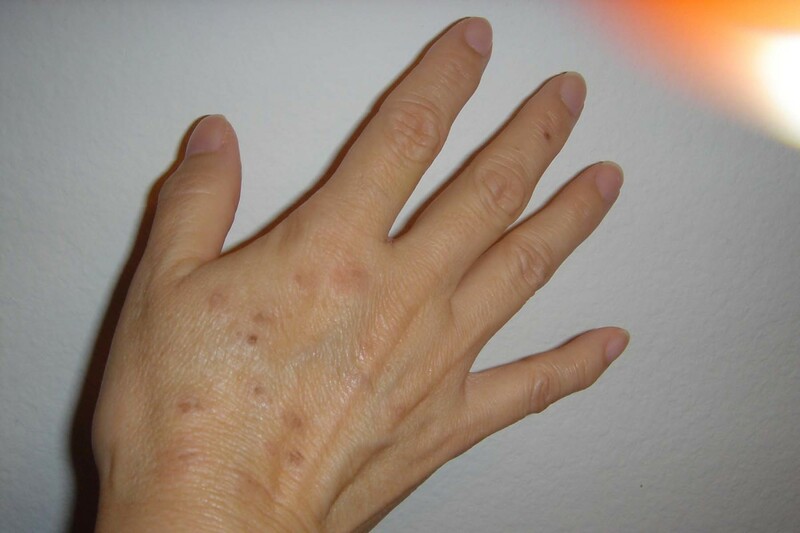 Postinflammatory HP is darkened skin following some form of injury or trauma to the skin, some examples being rashes, infections, allergic reactions, burns, surgery, spots and/or acne. Postinflammatory HP may lighten over time of its own accord once the cause is eradicated. However, to hasten the skin returning to its normal colouring, many people use skin lightening products. 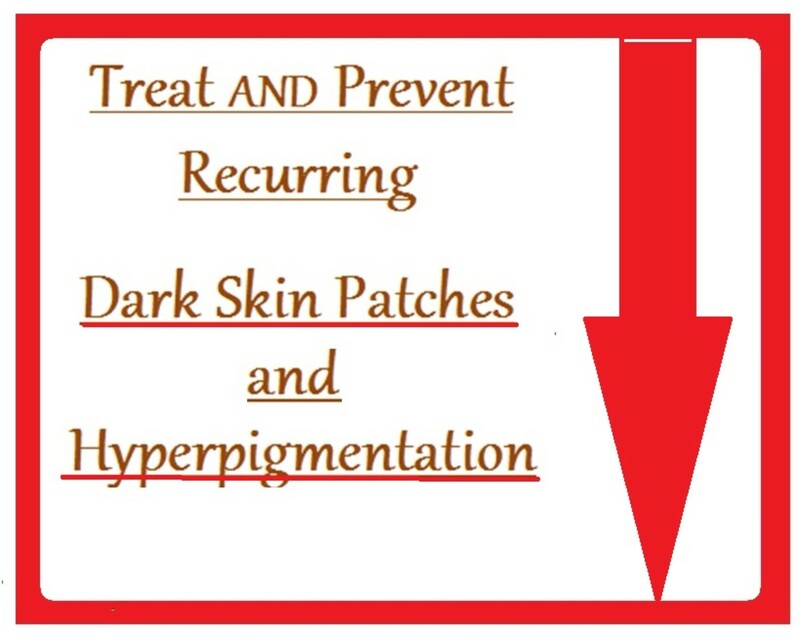 If you are now unquestionably determined to mitigate and control the presence of dark skin patches on your skin and gain/keep an even complexion or skin tone, any treatment option you employ to fade the skin MUST be an ongoing activity until the marks are gone and, alongside the treatment to fade the dark skin, sunscreen MUST be used religiously. Sunscreen is NOT an optional extra in the fight against dark spots, melasma, liver spots, acne scars etc. Even people of colour need to wear sunscreen and applying it needs to become a lifetime regime. Choose a high SPF broad spectrum sunscreen (SPF 30 or above) and apply it daily, reapplying as necessary throughout the day. Please note that this advice applies to people with dark/black skin too. People who spent time, effort and money in applying treatments for lightening darkened skin are likely literally wasting their time if they do not apply sunscreen consistently. This is because if the conditions that caused the hyperpigmentation are still present it will simply recur. That is, if the skin is still being exposed to sunlight, that sunlight will activate the body to overproduce melanin and thus the dark skin is almost certain to return. NB: Consult your doctor to formally diagnose your skin condition and to advise whether or not it is possible to eliminate the root cause of the hyperpigmentation - although do not be surprised to learn that root causes such as hormones and hereditary cannot be eliminated.) In addition, as with any new health regime, it is advisable to confer with your health professional beforehand. It's odd, but even when people know that sunshine is a significant risk factor in recurring dark skin patches, they may still somehow choose to put more emphasis on fading the dark spots (i.e. treatment) than limiting sun damage on the skin (i.e. prevention). Even when you are indoors, because sunlight can get to the skin through windows etc - sun protection is a must. Although primarily touted as an anti-aging product, in the writer's experience this product is outstanding at fading dark skin patches. The writer of this page suffered recurring dark spots in her teens and well beyond. Thankfully it is no longer a problem but when recently a very dear close relative had similar skin issues she was determined to try to help and in researching came upon a Vitamin C Anti Aging Serum which, curiously, had received exceptionally good reviews concerning it's fading of dark spots properties. The writer approached her relative about using the OZ Naturals Vitamin C Serum pictured on this page and, because nothing else had had much effect, she decided to give it a try. Although there was some scepticism about the testimonials, for the writer's relative, in a relatively short period of time, there was indeed a significant, visible difference and improvement in skin tone. Please note it was applied directly to the skin (i.e. straight after cleansing) and it was found that using a cotton bud for application helped a lot for treating individual small spots of darkened skin - leaving unaffected skin untouched by the serum. Apply sunscreen daily whilst trying to fade the dark spots. And, once faded, you must still continue to use it daily. Religiously applying it every day and re-applying it as necessary may be a chore, but it is your safest bet if you truly want an even skin tone. Do not expect to see instant results when you are working on lightening hyperpigmentation. Give a new regime, to fade the dark skin and simultaneously protect it with daily application of sunscreen, at least 8 weeks. You could well start seeing result before this time but each person is different so do be patient. Please be aware that even one day without sunscreen could set you back and undo some of the time and effort previously put into fading the dark skin. It should be noted that people with dark or black skin also need to use sunscreen when treating hyperpigmentation. Not burning easily does not mean you do not need it. Remember sunlight triggers the production of melanin/dark skin, so do not ignore the importance of sunscreen and reduction of sun exposure generally. Finding a high SPF (30 or above) broad spectrum sunscreen which doesn't leave a ghostly white caste on dark skin can be very difficult and so discovering Eltamd UV Clear SPF 46 was, quite frankly, a relief for the writer's relative. Previously she had used a tinted sunscreen even though the tint wasn't an exact match for her skin tone and she had to compensate for this by always using makeup on top. She found that even though the tint wasn't an exact match for her skin tone, at least the foundation gave a more natural, less ghostly, look. Nowadays, however, with the clear high SPF broad spectrum sunscreen, wearing foundation is optional and not a must. If you are like the writer's relative and feel the need to hide facial skin discolouration at times, you may well elect to wear foundation, applying sunscreen beforehand. She found a mineral foundation is very good for concealing imperfections and uneven skin tone. There are a wide variety of shades to choose from, so finding the right colour was not really an issue. It's easily applied, and doesn't feel too heavy on the skin even though it gives near flawless coverage. When wearing it, most importantly, she could easily forget about her skin and go about her day to day life more confidently. Finally for those who wear make-up, even if your foundation has an SPF of 15, it is still advisable to apply a broad spectrum sunscreen under the makeup. 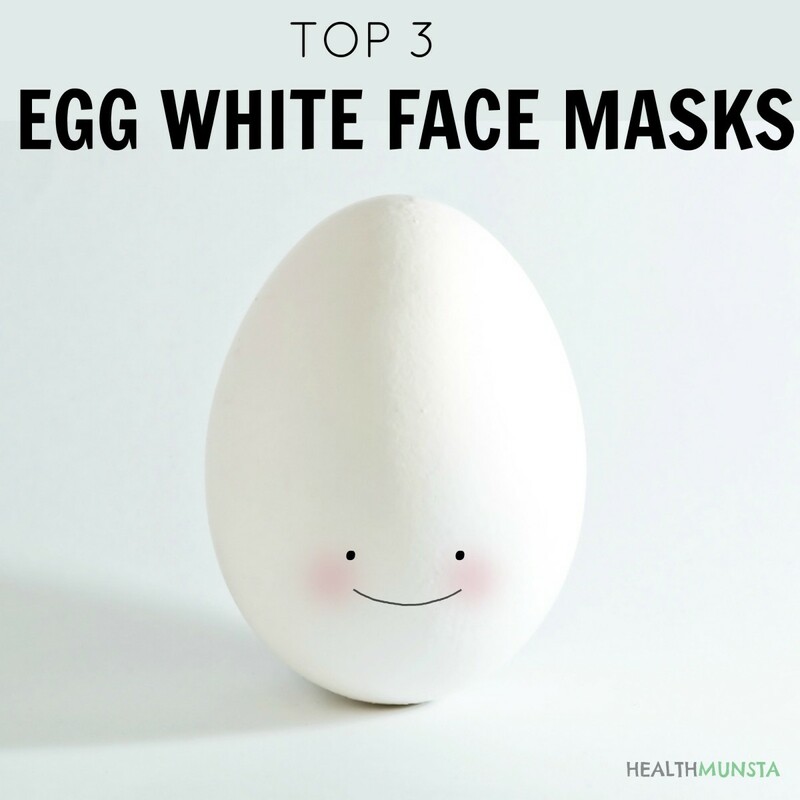 Natural remedies are a viable alternative to options such as hydroquinone skin bleaching creams, laser treatment, chemical peels, or microdermabrasion. Many of the aforementioned treatments are expensive and of course side effects must be carefully looked into before embarking on any treatment option. Natural treatment options are more cost effective and expenditure is something that must be carefully considered when you bear in mind that hereditary or hormonal causes of HP cannot be eradicated - meaning treatment is ongoing and not time limited. Thus electing to use a treatment option within your budget is important. 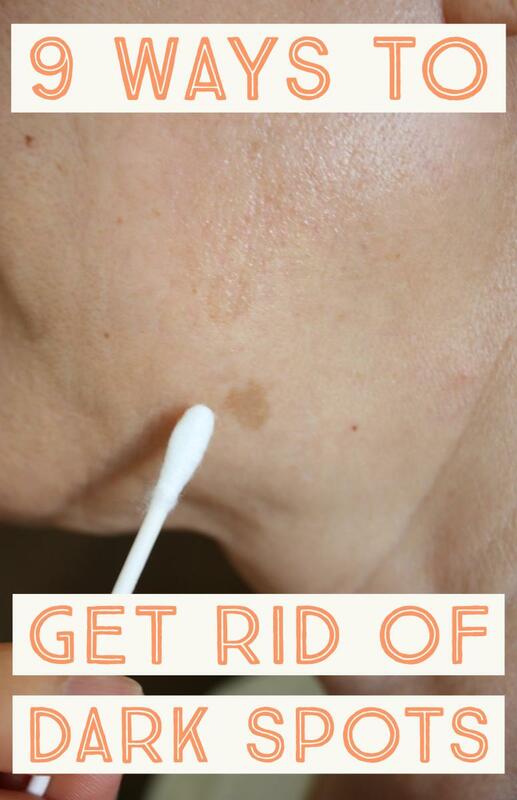 Whatever method you employ, if the HP consists of very small spots, a cotton bud can be used to apply the treatment, targeting just the dark spots. Basically you want to treat only the darker skin, rather than applying the treatment to your entire face or wherever. Turmeric powder is a natural remedy for skin lightening. 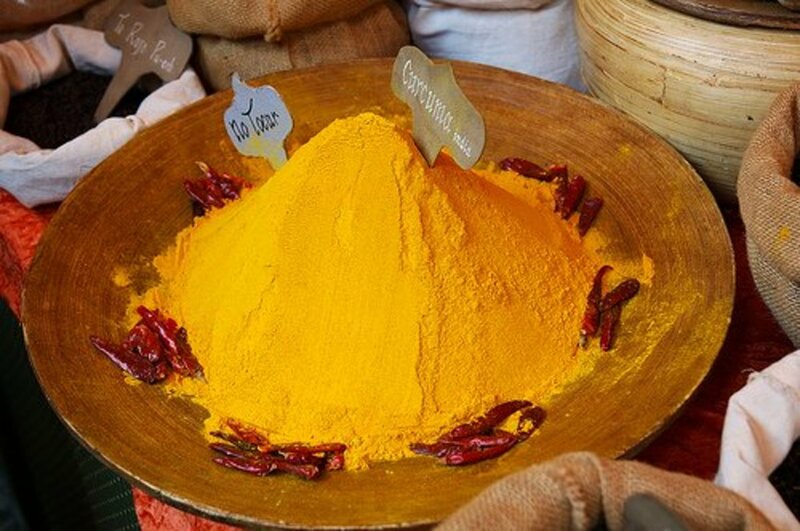 One treatment method for turmeric is to mix it with a little of your usual face cream to form a paste and then apply to only the darkened areas of cleansed skin for between 10 and 30 minutes maximum, (starting with 10 minutes and building up to 30 minutes if no adverse skin reaction occurs). Then gently but thoroughly wipe it off and cleanse the skin again. Caution: Turmeric stains -so wear/use old clothes, old towels, old gloves etc to avoid spoiling such items and/or staining fingernails. In particular, those with very fair skin colour will benefit from a skin test in an inconspicuous area as turmeric may stain the skin itself. If skin staining occurs try using less turmeric. Slice a red onion and rub it directly onto the cleansed darkened areas of skin on a daily basis to lighten hyperpigmentation. Another method of using red onion is to grate it, squeeze out the juice and apply to the cleansed discoloured skin. 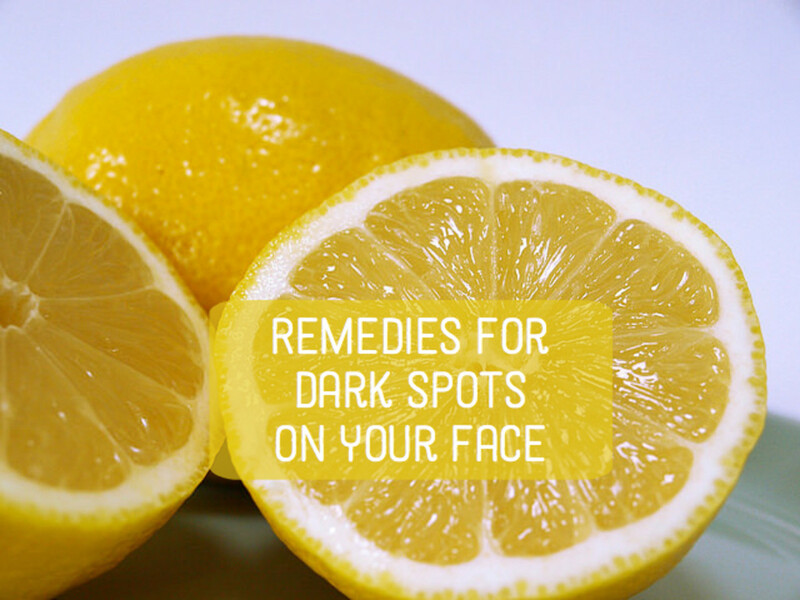 Apply to the darkened areas - use a cotton bud as necessary for small dark spots. Wash off after 40 minutes maximum. Choose Organic Apple Cider Vinegar and dilute one part vinegar with two parts water. Use a cotton bud or cotton wool to apply it to the previously cleansed darkened skin to lighten and brighten skin tone. 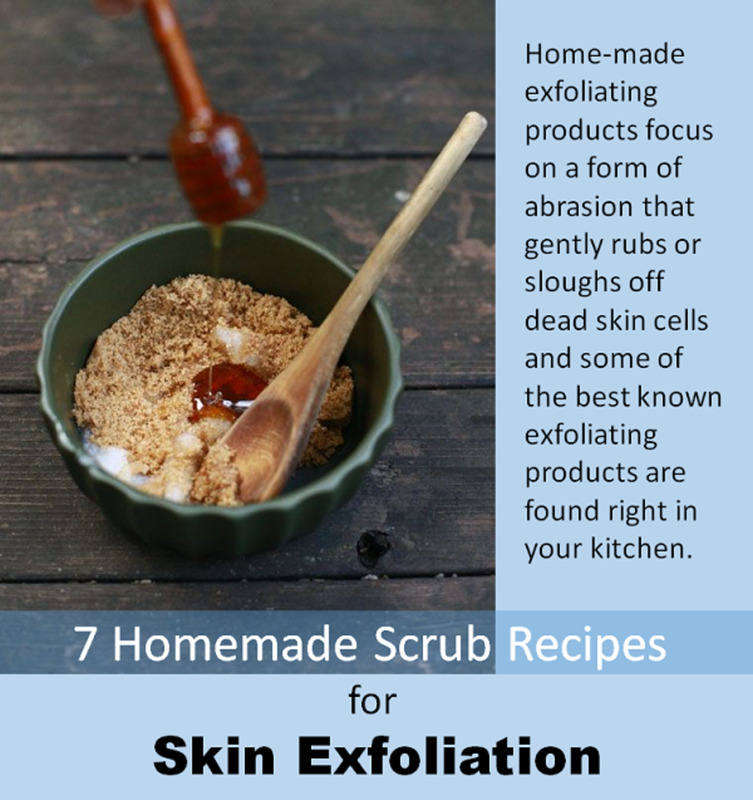 If there is no adverse skin reaction you can work towards leaving the mixture on the skin overnight. Once again, whatever treatment option you use to fade dark skin, it is imperative to use sunscreen. This is true even if you are very dark skinned. Sunscreen is simply a must during treatment to fade dark marks and it must be used even when the dark marks are fading/faded. Particularly if you have sensitive skin it is wise to apply the substance for a much shorter amount of time to check for allergic or negative reaction. If all is well then gradually build up to the time specified, but never exceeding that time as it may do mark harm than good. Likewise, you can dilute the substance the first few times you use it. In the event of an allergic or negative reaction, discontinue applying the substance. Finally, remember each person is different and what works for some may not work for everyone. Some will see results relatively quickly but do be patient if this is not the case for you and allow approximately 8 weeks to pass before deciding on whether or not a particular remedy is working for you. As a general rule, before proceeding with health related suggestions in any internet article, it is advisable to seek professional medical advice. Make no mistake - if your skin has a tendency towards hyperpigmentation, simply fading the dark skin is very unlikely to be a permanent fix. Sunscreen is an essential preventative measure against dark spots and HP - wear it in all seasons and remember, even when you are indoors the sun's rays can still reach you through windows and the like. Make it a habit to wear sunscreen daily, whether you plan to go out or not. Limiting sun exposure is paramount – remember midday is when skin is most at risk of sun exposure so limit the time you spend in the sun at this time and the hours either side of midday. Obviously it is not always going to be practical to be inside at these times but when outside try to stay in the shade, use a sunhat, broad brimmed hat, peaked cap or visor, and try to turn your face away from winter or summer sun as far as possible. The simple truth is there is no way to guarantee complete and permanent eradication of hyperpigmentation. However, you can help fade it with consistent use of one of the substances detailed above, and apply sunscreen religiously (with make up on top if wanted) to make a discernible and positive difference.